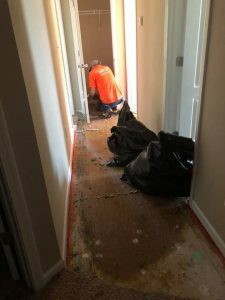 911 Restoration of Cleveland is the water cleanup company you can trust to restore your home or business after it has been affected by a sewage backup. The repair techs have many years cleaning and decontaminating properties in Cleveland, Parma, and Lakewood after raw sewage has overflowed into the interior of their home or business. Sewage is also known as ‘black water’ and is considered to be a category three water. This means that the water is filled with bacteria and toxins that can be harmful to your health. Black water can invade your home or business unexpectedly, but no matter when a sewage backup occurs, 911 Restoration of Cleveland will be there, 24/7/365, to handle the necessary sewage water cleanup. The repair techs know how urgent an emergency involving toilet water damage can be, so they make sure that customers can count on them to arrive at their property within 45 minutes of receiving their call. 911 Restoration works with IICRC Certified technicians who use equipment to extract black water out of your home after a sewage backup and completely decontaminate the area. So, give us a call the moment you notice signs of toilet water damage in your property and our repair techs will leave your home looking clean and smelling fresh today! Cleaning sewage spills without the right equipment and protective gear is dangerous because of the bacteria that black water carries. These germs can cause all kinds of severe health conditions. Sewage can be challenging to remove from hardwood, carpets, textiles, drywall, and tiles. That’s why the technicians in Cleveland use industrial strength cleaning products that will ensure the affected area is thoroughly disinfected. 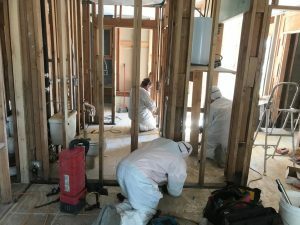 Instead of trying these techniques on your own, the best way to clean your property is by calling the sewage restoration professionals. They are licensed, insured, and bonded, so you can feel protected by hiring them to remediate the sewage backup. We will begin the sewage restoration process by providing you with a free visual inspection and estimate to determine the source of the problem. Once the technicians understand the full extent of the work, they will get right to work the very same day you call us. So, when a toilet overflows into your property, and you need immediate sewage cleanup services, call the water cleanup company you can trust in Cleveland to assist you any time, day or night. 911 Restoration of Cleveland consistently provides quality sewage water cleanup and restoration services that will make extracting black water out of your home or business as hassle-free and convenient for you as possible. The technicians will begin and end our work with only your absolute satisfaction in mind. Our fast response time, year-round availability, and our customer-oriented services will make sure that your home gets back into shape as soon as possible. To provide you with further convenience, the professionals will also work with your insurance company to get the most affordable price on our sewage water cleanup services. If you never filed a claim with your insurance provider before you can trust us to do it for you. Our staff members have worked with many different insurance companies over the years, and they know what information needs to be submitted to get the most out of your policy. When a sewage spill occurs within your property, don’t waste any time. 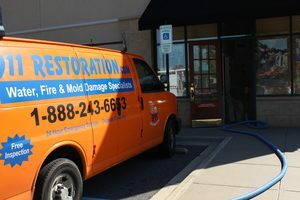 Call the experts at 911 Restoration of Cleveland for the quality assistance with any sewage concern today!